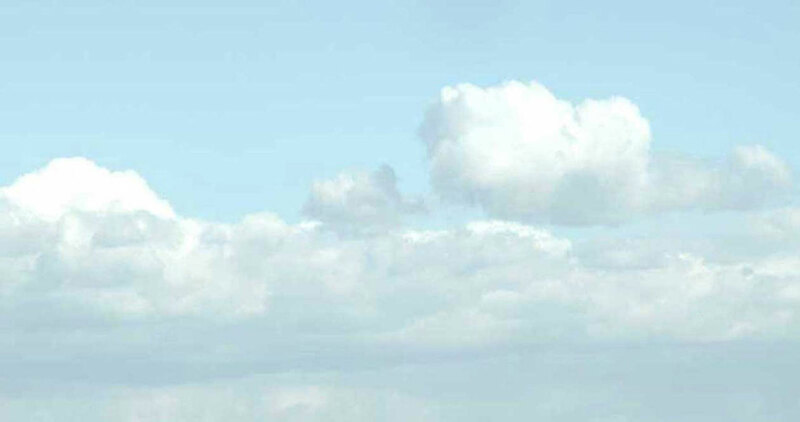 Nimbostratus filled up the sky completely. Constantly shifting, the different shades of ominous blackness rushed across at varying speeds, but never letting a shaft of sunshine through the cloud cover. It is a sign of rain. Trees began to shake with an occasional twig breaking off as the wind battered the far end of the Cornish peninsula. This was a gale at Force 8 inland, where there was shelter. Down on the shore, there would be no protection and the sea would be very rough with waves of 5 metres and more, foaming at the tops. Marazion is a small town situated on the English Channel side near the tip of Cornwall, like nearby Penzance, sheltered from the full brunt of the Atlantic storms. 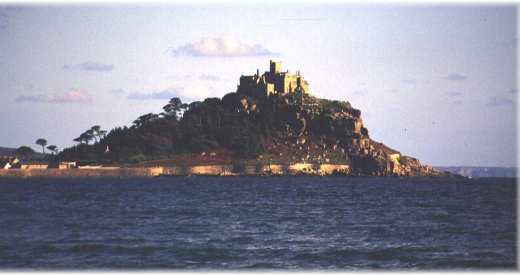 It is distinguished by the presence of an island called St. Michaels Mount, complete with castle, a quarter-mile offshore. We arrived at the low spring tide around midday to find the causeway connecting the island to mainland dry, and the tide receding on either side. The loose sand felt like hailstones on our faces, as the gale propelled us over fine sand and along the causeway, finding shelter by a large outcrop of granite. Observations of the snail-like molluscs crawling over the rock quickly indicated that I was not in Sussex where the variety of gastropods on the shore is very limited. The Thick Topshell, Monodonta lineata, which is sometimes called a Toothed Winkle because of the tooth on the lip, and because it occupies the mid-shore position usually occupied by winkles. However, it is a true topshell and on British shores only found in the south-west coexisting with Periwinkles Littorina littorea which occupy marginally different niches. A more comprehensive selection of winkles was also to be found, with all four species recorded in British seas to be searched out and discovered on this shore. Topshells were represented by four species and limpets by three species of Patella, plus the Blue-rayed Limpet, Patina pellucida, found on kelp holdfast by Jan Light (Conchological Society). Under the large boulders near the Causeway, Common Blennies, Lipophrys pholis, congregated under boulders, as expected. Dry rock gave way to wet weedy terrain with shallow pools and a few slabs of rock nearer low water. Braced against the gale, regular gusts were Force 9 and could blow you of your slippery foothold. This made conditions for observing the fauna just about as difficult as I had known. However, despite being late in the year, (in Sussex large mobile shore fauna is almost totally absent during October) the shore was splendidly rich in variety, and included many southern species. Many seaweeds were unfamiliar to me and many only recognised from the books. 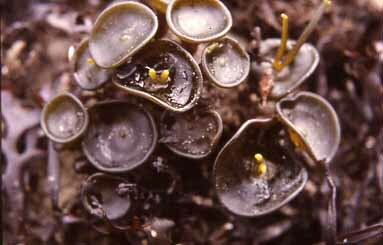 The cupped base of the Thongweed, Himanthalia elongata, was most noticeable. 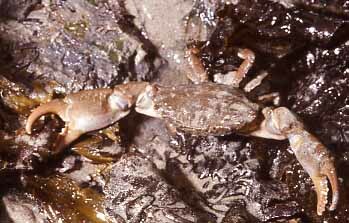 The usual shore populations of common invertebrates were present, but also the southern species of crab Xantho incisus which was very common (over 500 present, scores seen) under boulders. 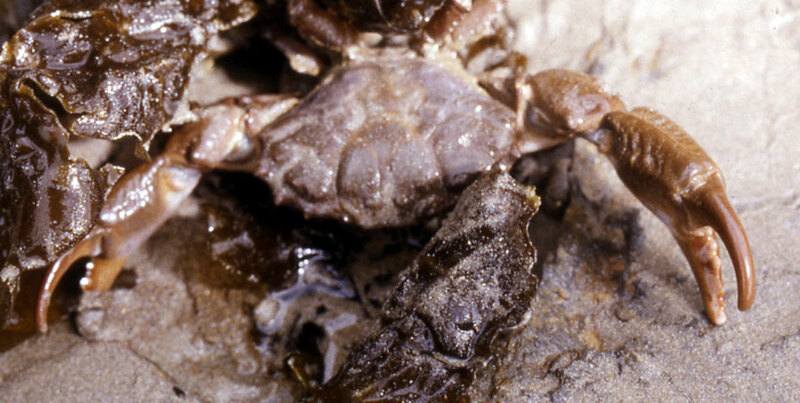 There are two species of Xantho crab from British seas. The specimens found at Marazion had white claws and a chocolate brown carapace, but colour is not the distinguishing guide - the same species could also have black claws. The back legs lacked the bristles or setae that are found on Xantho pilipes. The diet of this crab is not well known, but it will eat smaller crabs of other species including the Hairy Crab, Pilumnus hirtellus. We only explored a small area, but although there was plenty of water there were no large pools. A full record of the discoveries is listed in the Porcupine Newsletter (December 1992) with a long list of molluscs, with records also on the CBRU computer. Worm Pipefish, Nerophis lumbriciformis were frequent under rocks and amongst the weed and are easily overlooked because they resemble a stripe of brown weed. The Painted Topshell, Calliostoma zizyphinum, sported bright contrasty markings on this shore. Netted Dogwhelk, Hinia reticulata, were surprisingly very common. Brittlestars could occasionally be discovered. 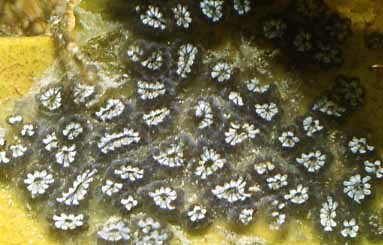 Star Sea Squirt, Botryllus schlosseri, were cream zooids on dark green and colonised the underside of rocks. Boots would seem to be best footwear on this shore, with only a small net necessary. Goggles were the accessory overlooked as we walked backwards for over 20 minutes into the sandstorm. Some specimens were examined more closely under a microscope at the CBRU, Pool. I took a Xantho crab back to my aquarium for further study, but it only survived for 6 months.